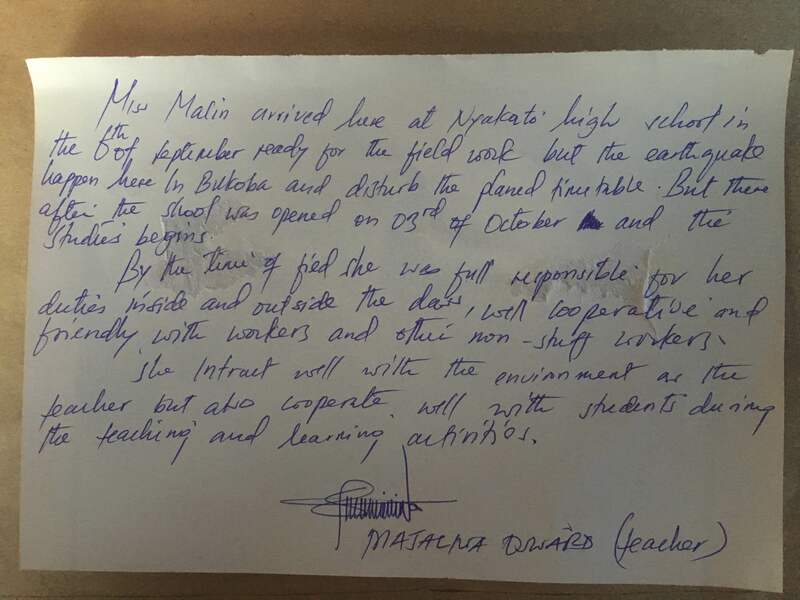 Miss Malin (Forslund) arrived here at Nyakato High School at the 6th of September ready for field work. But then at the 10th of the same month only four days after her arrival, the earthquake happened here in Bukoba and disturbed the planned timetable. We were wondering, did miss Malin bring the earthquake from Sweden? But there after we shifted to another location and the school was opened on the 3rd of October and the students began their studies. By the time of field Miss Malin was fully responsible for her duties inside and outside of the class, well cooperative and friendly with workers and other non-staff workers. She interact well with the environment as a teacher but also cooperate well with students during teaching and learning activities.